"Zhuyin" redirects here. For the mythological creature, see Zhulong (mythology). The informal name "Bopomofo" is derived from the first four syllables in the conventional ordering of available syllables in Mandarin Chinese. The four Bopomofo characters (ㄅㄆㄇㄈ) that correspond to these syllables are usually placed first in a list of these characters. The same sequence is sometimes used by other speakers of Chinese to refer to other phonetic systems. The original formal name of the system was Guóyīn Zìmǔ (traditional 國音字母, simplified 国音字母, lit. "National Language Phonetic Alphabet") and Zhùyīn Zìmǔ (traditional 註音字母, simplified 注音字母, lit. "Phonetic Alphabet" or "Annotated Phonetic Letters"). It was later renamed Zhùyīn Fúhào (traditional 注音符號, simplified 注音符号), meaning "phonetic symbols". In official documents, Zhuyin is occasionally called "Mandarin Phonetic Symbols I" (國語注音符號第一式), abbreviated as "MPS I" (注音一式). In English translations, the system is often also called either Chu-yin or the Mandarin Phonetic Symbols. A romanized phonetic system was released in 1984 as Mandarin Phonetic Symbols II (MPS II). The Commission on the Unification of Pronunciation, led by Wu Zhihui from 1912 to 1913, created a system called Zhuyin Zimu, which was based on Zhang Binglin's shorthand. A draft was released on July 11, 1913, by the Republic of China National Ministry of Education, but it was not officially proclaimed until November 23, 1928. It was later renamed first Guoyin Zimu and then, in April 1930, Zhuyin Fuhao. The last renaming addressed fears that the alphabetic system might independently replace Chinese characters. Zhuyin remains the predominant phonetic system in teaching reading and writing in elementary school in Taiwan. It is also one of the most popular ways to enter Chinese characters into computers and smartphones and to look up characters in a dictionary. In elementary school, particularly in the lower years, Chinese characters in textbooks are often annotated with Zhuyin as ruby characters as an aid to learning. Additionally, one children's newspaper in Taiwan, the Mandarin Daily News, annotates all articles with Zhuyin ruby characters. In teaching Mandarin, Taiwan institutions and some overseas communities use Zhuyin as a learning tool. The Zhuyin characters were created by Zhang Binglin, and taken mainly from "regularised" forms of ancient Chinese characters, the modern readings of which contain the sound that each letter represents. It is to be noted that the first consonants are articulated from the front of the mouth to the back, /b/, /p/, /m/, /f/, /d/, /t/, /n/, /l/ etc. Zhuyin is written in the same stroke order rule as Chinese characters. Note that ㄖ is written with three strokes, unlike the character from which it is derived (Chinese: 日; pinyin: rì), which has four strokes. As shown in the following table, tone marks for the second, third, and fourth tones are shared between bopomofo and pinyin. In bopomofo, the lack of a marker is used to indicate the first tone while a dot above indicates the fifth tone (also known as the neutral tone). In pinyin, a macron (overbar) indicates the first tone and the lack of a marker indicates the fifth tone. Unlike Hanyu Pinyin, Zhuyin aligns well with the hanzi characters in books whose texts are printed vertically, making Zhuyin better suited for annotating the pronunciation of vertically oriented Chinese text. Zhuyin, when used in conjunction with Chinese characters, are typically placed to the right of the Chinese character vertically or to the top of the Chinese character in a horizontal print (see Ruby characters). Érhuà-ed words merge as a single syllable, which means ㄦ is attached to the precedent syllable (like 歌兒（ㄍㄜㄦ） gēr). In case the syllable uses other tones than 1st tone, the tone is attached to the penultimate syllable, but not to ㄦ (e.g. 哪兒（ㄋㄚˇㄦ） nǎr; 一（ㄧ）點兒（ㄉㄧㄢˇㄦ） yīdiǎnr; 好（ㄏㄠˇ）玩兒（ㄨㄢˊㄦ） hǎowánr). 2 ⟨ü⟩ is written as ⟨u⟩ after ⟨j⟩, ⟨q⟩, ⟨x⟩, or ⟨y⟩. 3 ⟨ㄨㄛ⟩/⟨-uo⟩ is written as ⟨ㄛ⟩/⟨-o⟩ after ⟨ㄅ⟩/⟨-b⟩, ⟨ㄆ⟩/⟨-p⟩, ⟨ㄇ⟩/⟨-m⟩, ⟨ㄈ⟩/⟨-f⟩. 4 ⟨weng⟩ is pronounced [oŋ] (written as ⟨-ong⟩) when it follows an initial. Three letters formerly used in non-standard dialects of Mandarin are now also used to write other Chinese varieties. Some Zhuyin fonts do not contain these letters; see External links for PDF pictures. In Taiwan, Bopomofo is used to teach Taiwanese Hokkien, and is also used to transcribe it phonetically in contexts such as on storefront signs, karaoke lyrics, and film subtitles. Zhuyin can be used as an input method for Chinese characters. It is one of the few input methods that can be found on most modern personal computers without the user having to download or install any additional software. It is also one of the few input methods that can be used for inputting Chinese characters on certain cell phones. Zhuyin was added to the Unicode Standard in October 1991 with the release of version 1.0. Additional characters were added in September 1999 with the release of version 3.0. Unicode 3.0 also added the characters U+02EA and U+02EB, in the Spacing Modifier Letters block. These two characters are now (since Unicode 6.0) classified as Bopomofo characters. ^ 中國文字改革委員會 (Committee for the Reform of the Chinese Written Language). 漢語拼音方案（草案） (Scheme for the Chinese Phonetic Alphabet (Draft)). Beijing. Feb 1956. Page 15. "注音字母是1913年拟定，1918年公布的。"
^ Shih Hsiu-Chuan (18 Sep 2008). "Hanyu Pinyin to be standard system in 2009". Taipei Times. p. 2. ^ Taiwan Headlines. "Taiwan Headlines: Society News: New Taiwanese dictionary unveiled". Government Information Office, Taiwan(ROC). ^ John DeFrancis. The Chinese Language: Fact and Fantasy. Honolulu, HI, USA: University of Hawaii Press, 1984. p. 242. ^ Wenlin dictionary, entry 𠫓. ^ "Unihan data for U+20000". ^ Wenlin dictionary, entry 𠃉. ^ "Unihan data for U+4E5A". ^ Wenlin dictionary, entry 𠃋. 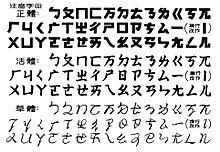 ^ Michael Everson, H. W. Ho, Andrew West, "Proposal to encode one Bopomofo character in the UCS", SC2 WG2 N3179. ^ "The Zhuyin Alphabet 注音字母 Transcription System (Bo-po-mo-fo) (www.chinaknowledge.de)". www.chinaknowledge.de. Bopomofo annotations – adds inline and pop-up annotations with bopomofo pronunciation and English definitions to Chinese text or web pages. NPA->IPA National Phonetic Alphabet (bopomofo) spellings of words transliterated into the International Phonetic Alphabet. The vowel values have been verified against the official IPA site. See IPA help preview, SIL International website. See IPA help preview, SIL International website. (Accessed 23-12-2010).